Once upon a time there was a man who lived on the moon. Night after night he saw joy and dancing on Earth so he caught a lift on the tail of a comet to experience life on our little blue planet. This is his story. I came across Moon Man from seeing the trailer on the "if you looked at this you might like..." part of a popular video-sharing website. The imagery looked pretty so I thought I would give it a go. The story of Moon Man was written in 1966 by the French writer and illustrator Jean-Thomas "Tomi" Ungerer, forming part of a large collection built up over 50 years. The premise of someone on the moon coming to Earth and experiencing life here is quite simple and a timeless story with story elements that will work irrespective of how many years pass between the publishing of the story and when it is told. The illustrations from the book have a similar timeless quality, well those I have seen anyway, with a sense of innocence and dreamy quality. 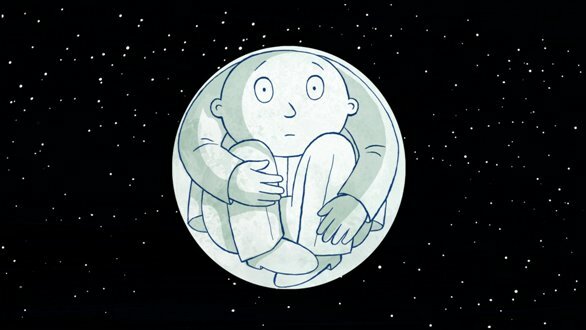 Moon Man (directed by Stephan Schesch) is the tale of the Man in the Moon who came to Earth by grabbing onto the tail of a passing comet (which looks more like an old-fashioned meteor to me). His arrival on Earth coincides with all the countries of the world being conquered by the President. During his victory speech the President is ... "inspired" to conquer the moon and is then promptly informed that they are under attack by an alien force (the incoming comet). The President and his significant armed force go to the crash-site and discover that there is an alien on Earth that they must capture. Meanwhile, our titular Moon Man scampers and frolics through forests, joins in dances with children (yes, he has a little moon-walk), explores the countryside and eventually arrives at what can only be described as an Escher-inspired building. This building houses the "Inventor of Everything" who has been asleep for centuries. At the exact same time the Inventor is visited by the President of the World who would like a fireball built to take him to the moon so that it may be conquered (only he missed that last bit out). From here we are taken into a soft and gentle tale of friendship, fear of the other, and a cat and mouse caper all centred on our Moon Man and how we might get him home. The director (Stephan Schesch) and his team have taken some very bold decisions with design and colour palette. The designs of the characters in Moon Man are simple and bold. They have a sense of fun, especially the Inventor of Everything with his long nose and binocular-like glasses. The Moon Man himself manages to be otherworldly in his look when contrasted against the colourful world he has just joined. Looking at the illustrations for the original work, they are faithful but bolder in colour - more poster-like than water-colour. This gives them a bit more weight anchoring at times what can be a light story. The President, well.. he looks like a smug CEO. The main cast of characters (of which there are not many) reminded me at times of Asterix, with the President looking similar to how Caesar is represented, and the Inventor a bit like Getafix. The Moon Man himself if very child-like, like a hairless but well-dressed toddler. The adults fall into two style camps - they are either bland and unassuming (most that we meet) or ugly and grotesque (like those at the victory party held by the President). There is a lot of inventive design work in the grotesque character designs, especially the Presidential seductress who has a hairstyle representing a woman sitting on her head! I thought these grotesque character designs were a bit out there initially but they completely belonged in this world following and self-centred, self-important President around, hoping for some crumbs of recognition. It was almost a "modern" Palace of Versailles. The Inventor was my favourite character. There was always a way to answer a question or solve a problem. If he didn't know he would make it his mission to find out whilst forgetting to do what he was supposed to be doing. He also travelled around on some kind of yo-yo which I thought was neat and I really wanted one - it was a bit like a single wheel roller skate. They really managed to capture the essence of the inventor (and he reminded me at times of my ex-colleagues and their exploits in their sheds). Other than the Inventor, my other favourite character would have to be the polar bear in the President's residence. You are never quite sure if it is a stuffed polar bear or one that was captured and has to take up poses to hide its state of life! It is a very simple design but so effective, similar to what I would expect Aardman to have done. It does all the work with its face and provides great, but brief comedy. The quality of the animation is good. There are moments when it feels smooth and effortless and other where you can feel short-cuts have been taken to make the showcase parts really stand out. It is particularly strong at the beginning. In general the choice of art style, colours and lines is very forgiving in covering up any inconsistencies, drawing your eye away from those items that don't quite fit or that they would rather you didn't see. This is not the case with our Moon Man, given he is pale against a dark background the limited scenes are quite obvious. The presentation seems to suggest different styles of animation *could* have been used. 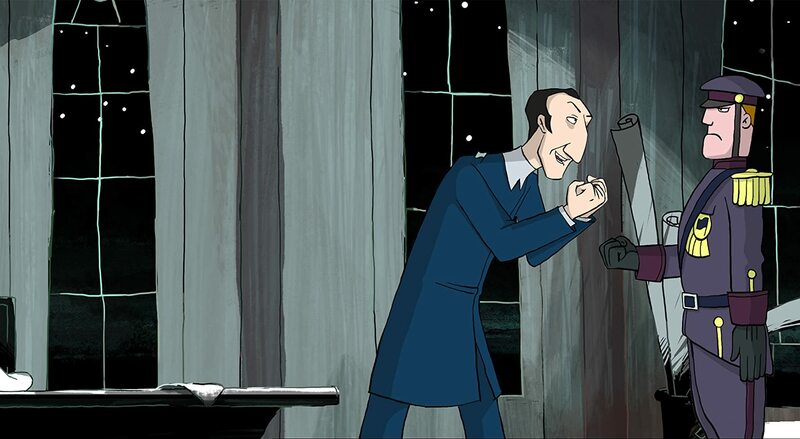 We get the sense of paper cut-outs at the beginning (similar to scenes in The Grand Budapest Hotel) and peppered throughout the feature and traditional 2D computer animation the rest of the time. 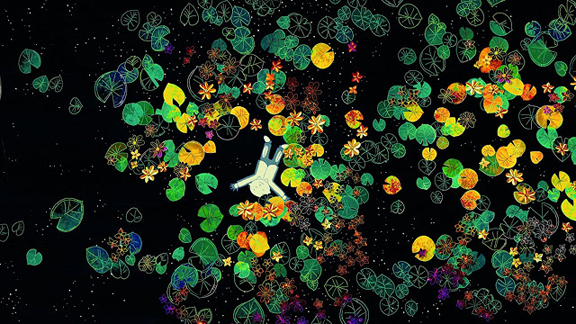 As such it is an inventive looking 2D animation. The standout moments for me were in the opening third where the Moon Man arrives on Earth. They managed to capture a sense of child-like wonder as he explores the world. Considering he is just a white shape with grey to black lines and shading it is amazing the emotional range he conveys. A showcase of this is when he has to get out of his crater where he seems to go through all of the early stages of movement (under normal gravity) that a very young child would, before he gets on his feet. The world he explores is ... trippy. The colours are so vibrant and bright against the near jet-black of the night sky or of the sky reflected in water. Within this world we have near fantastical beasts and plants realised in distinctive colours and shapes. Throughout this he is shown with a constant sense of eternal wonder on his face. The most impressive beast was a transparent whale, whilst the sequence of him floating through lilies (above) is sublime. Our introduction to the Inventor of Everything and his house is another. He lives in a house clearly inspired by Escher with staircases and archways. Whilst he has slept cobwebs have formed containing in them chemical formulas and the diagrammatic representation of molecules. His coffee machine is also an invention to behold! It is this kind of imagery that had me hooked in the trailer and I found it so inventive and refreshing. This opening section truly is a work of art. As I suggested earlier the story is timeless but contains darker elements, like a good story aimed at children should. We have the controlling, smug, all-conquering President who has now set his sights on the moon and is prepared to do what is necessary to get there. Could that include denying someone the ability to go home because of their selfish wants? We also have a "fear of the other" - there is an alien among us who must be captured and imprisoned for no other reason than they are different. Both of these threads run through the feature and the right level so as not to swamp the narrative but still provides a sinister undertone. On the flip side we have a wonderful story about companionship and friends. 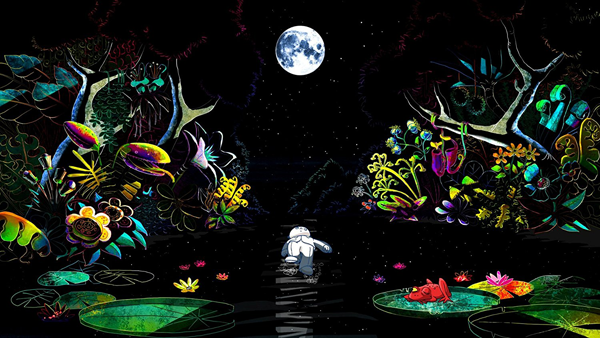 The children take Moon Man to their hearts, whether he is on the moon or walking around. I would put the Inventor in this group too - he has such a childlike curiosity and views the world as full of possibility and discovery. There is a very touching friendship that develops between the Inventor and the Moon Man which feels like the main focus of the story. From the film I took away the idea that as adults we should look at the world with a bit more appreciation, open mindedness and imagination. My biggest issue with Moon Man was its length - it seems a trivial matter but this had quite an impact on the pacing and what was shown. It felt a bit too long, as if there was 60 minutes of really good story and sensational imagery (some of it is really exceptional) whose flow was broken by asides and musical numbers. These breaks and asides took away from the quality of the other work and, for me, were short stories that added nothing to the main plot. We have sequences set at night which are far and away the strongest and most visually appealing and then a few during the day. These day-based sequences are less appealing visually and again I found them a bit superfluous to the main narrative and it seemed to grind to a halt to then have to start up again. It was as if it was looking to fill 90 minutes rather than a shorter more potent feature. I'm conflicted in my opinion of Moon Man. As I wrote down what I thought of it I found some of my opinions changing, causing a slight re-evaluation of the feature as I found more things I liked about it. I loved the idea of it and found the trailer to be quite exciting. Overall it just didn't live up to my expectations, unfortunately, even with my new-found views. There are some really neat sequences early on when he comes to Earth, quite vibrant, colourful and full of contrasting shapes - had it stayed with this look throughout I would have been over the moon (if you'll pardon the pun). I liked the character designs a lot, especially the Inventor. Whilst I liked the core of the story the deviations from the story broke its flow and this resulting in the sense that the feature was dragging and baggy. I'm quite happy for the story to drag as long as the visuals are there, and towards the latter half, it lost its more vibrant, out-there imagery. 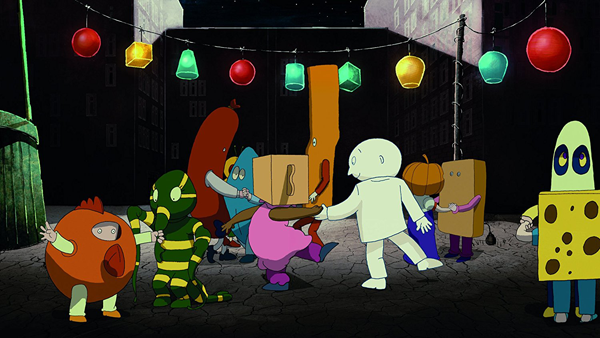 Moon Man is a fine production with some utterly astounding standout sequences and it is entertaining family viewing. I just would have preferred the more of the out-there imagery and a shorter running time. Moon Man is available on DVD in the UK from Spirit Entertainment. In the USA it is available on DVD and Blu-Ray from Tribeca Film, as well as available streaming through Amazon.